Twilio (TWLO) reported a wider loss for the third quarter due to higher operating expenses. The results exceeded analysts’ expectations. The cloud communications platform lifted its full-year 2018 guidance. Following this, the stock surged over 9% in the after-market session. Net loss for the quarter widened to $27.1 million or $0.28 per share from $23.5 million or $0.25 per share last year. Non-GAAP EPS was $0.07 compared to a loss of $0.08 per share a year ago. Total revenue soared 68% to $168.9 million driven by growth in base revenue. As of September 30, 2018, the company has 61,153 active customer accounts, up from 46,489 accounts as of September 30, 2017. For the third quarter, dollar-based net expansion rate rose to 145% from 122% a year ago. 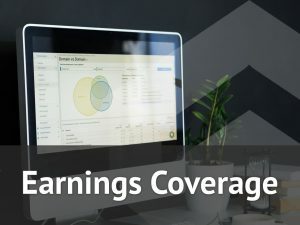 Looking ahead into the fourth quarter, the company expects total revenue in the range of $183 million to $185 million and non-GAAP EPS in the range of $0.03 to $0.04. Base revenue is predicted to be between $174 million and $175 million. 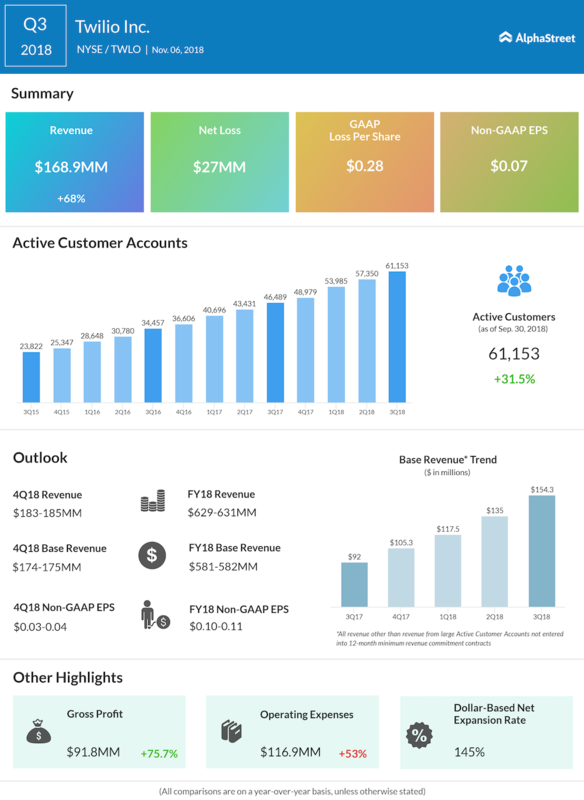 For the full year 2018, Twilio lifted total revenue outlook to the range of $629 million to $631 million from the prior estimate of $585.5 million to $589.5 million and its non-GAAP EPS guidance to the range of $0.10 to $0.11 from the prior range of $0.02 to $0.04. Base revenue forecast was lifted to the range of $581 million to $582 million from the prior range of $546.5 million to $548.5 million. During the third quarter, the company appointed two persons to the leadership team: Khozema Shipchandler as CFO and Nils Puhlmann as Chief Trust and Security Officer. Also, Twilio agreed to buy the bulk email sender SendGrid (SEND) for about $2 billion. Apart from the current voice, video and chat platforms, this deal will help Twilio to expand its presence in the email category. The key highlights made during the quarter include the purchase of long-time partner Ytica, the general availability of first fully programmable cloud contact center platform Twilio Flex, and the launch of new API Twilio Pay payment processor. The highlights also include a fully programmable AI platform Twilio Autopilot, the launch of Twilio Super-SIM, and the expansion of its partnership with T-Mobile (TMUS). Shares of Twilio ended Tuesday’s regular session down 1.05% at $71.02 on the NYSE. The stock has risen over 137% in the past year and over 200% in the year so far.